Destroy the pins and the competition using this scary bowling ball at your alley! Hi there is a ball that says cannot ship outside of U.S i really want the ball is there any way i can buy it im in Australia? Unfortunately the people that do the custom made bowling balls cannot ship outside the US right now. We could ship to a forwarding company in the United States and you can then have it forwarded to you after that. You would have to work this out with the forwarding company before order with Bowling.com. is it possible to get this bowling ball in 9 lb? Unfortunately, this ball does not come in a 9lb. 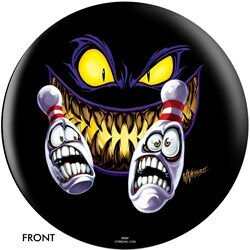 Due to the time it takes to produce the OnTheBallBowling Evil ball it will ship in 1-2 weeks. We cannot ship this ball outside the United States.